Sometimes the things that improve our singing the most have nothing to do with singing at all. 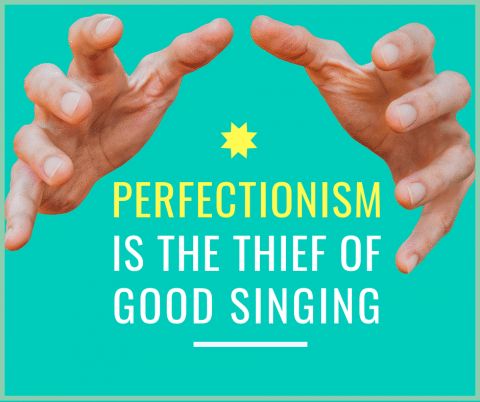 This couldn’t be more true when it comes to the standards we set for ourselves and why I say that perfectionism is the thief of good singing. We all want to sound good but at what point does that tip into perfectionism, and how can you know? Do I set standards waaaaay higher and more demanding for myself then the standards I apply to my friends/colleagues/family? Do I ever find that I have all-or-nothing thinking where I feel “almost perfect” as a failure? Do I ever have difficulty taking pride in my accomplishments because I am so focused on tiny perceived mistakes or imperfections in my work that I have trouble acknowledging the larger achievement? If you answered “Yes” to any of these questions then you, my friend, just might be a perfectionist. Welcome to the club! Illustrious members include Steve Jobs, Mozart, Flaubert so you are in very good company. The thing is, while perfectionism may work for some people, it is mostly disastrous for singers. When we feel we have to be perfect it is fear based. For a perfectionist, being perfect is our best defense against our fears. Perhaps we think being perfect will insulate us from failure. Perhaps we believe that being perfect will bring us success, accolades or even love and adoration. We fear that if we are not perfect, we will loose what we have or not get what we want. We strive to be perfect out of an illusion of control rooted in fear. That fear lives in our body as tension and over-control which, as you know, effects the way our body is able to tap into our most efficient production of sound for singing. But the idea of “perfect” is really just an illusion. Perfect is not real, it is entirely our own creation. I think that one of the most glorious things about being human is that our perception shapes our reality. When we are able to get quiet and tap into our awareness, we have the ability to reshape our perceptions and in doing so, reframe our idea of perfection. The way I have been able to undo decades of attachment to perfectionism in my own singing (and life in general) is to ask myself, on a daily basis, to be “Perfectly Imperfect”. When I am being “Perfectly Imperfect” I remind myself that I am human, I have flaws and I make mistakes. With that awareness I can exhale. I no longer hold on so tightly when I sing from that energy and my technique works WAY better for me that way. But when I sing from a mindset of perfectionism, I force and manipulate because perfectionism leaves no room for error and I over-control because perfectionism leaves no room for trust. For me to truly sing well and reach the maximum potential of my instrument, there’s a level of letting go and trust in my technique and my talent that’s required. So today, as you go forward in your singing, can you let yourself be “Perfectly Imperfect”?